The Bible reveals that God's ultimate purpose for the world of mankind is to fulfill His promise to faithful Abraham, "In thee and in thy seed shall I bless all the families of the earth." But even to honest hearted Christians, that promise still seems far from its fulfillment and many questions persist. For instance, what does God intend to do to relieve the conditions of sin and death in the world? And when? Why has He waited so long? When is Jesus Christ going to establish His Kingdom on earth? And why is a plain reading of the Bible so difficult and confusing to so many? Is there a key which opens the door of understanding to the Bible for us? * The Biblical meaning of "ransom" and "restitution"
These and many other important Bible topics are discussed in depth. 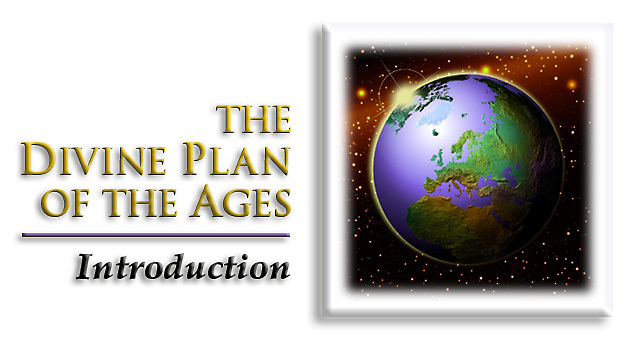 The opening statement of The Divine Plan of the Ages best describes its aim and its value as a key to Biblical understanding. "The title of this series of studies -- The Divine Plan of the Ages, suggests a progression in the Divine arrangement, foreknown to our God and orderly. We believe the teachings of divine revelation can be seen to be both beautiful and harmonious from this standpoint and from no other." "This is a notable book  bold, broad, and breezy; very refreshing after the stereotyped dogmas and platitudes which pass current in the theological world. It is a book for men and not for children . . .
"The one leading thought of this book . . . in a single word . . . is RESTITUTION or RESTORATION: Restoration, sharply and constantly distinguished from Universalism. The author is not a Universalist, nor anything near it. With him the second death is total and final. From it there is no redemption and no recovery. But he is a restorationist out and out. He holds that all men will rise from the dead  all be delivered from Adams sin and all its consequences sooner or later  all be put afresh and individually on trial, under new and improved conditions, with a fair chance of obtaining eternal life  so that none shall fail of the prize save by his own inexcusable crime. He holds that this restoration of the race as a whole  distinguished from the little flock, the elect, the Church, the bride of Christ, who will have been previously raised from the dead and exalted to be sharers of Christs own glory  will take place during the Millennial Age; progressively, if we mistake not, at any rate within or during the Thousand Years; and that at the close of that period, the incorrigible will be utterly destroyed for ever, and sin and sorrow thenceforward be no more. The author is strong upon the point that all loss through Adams sin will be more than made up to every man through Christ. Adam was created perfect. Every man must be restored to the like perfection, and then decide for himself his eternal destiny. . . .
". . . The Chapter of The Permission of Evil is alone more than worth the price of the whole volume, and is the fullest discussion of this great mystery, and the nearest approximation to a probably correct solution of it, with which we are acquainted."